Janatha Vimukthi Peramuna (JVP) leader Anura Kumara Dissanayake said today Prime Minister Ranil Wickremesinghe was directly involved in protecting Central Bank's former governor Arjuna Mahendran. He told Parliament during the debate on Bond Commission and PRECIFAC reports that the Prime Minister's entire approach was directed towards protecting the fraudsters rather than punishing them. Mr. Dissanayake said the PCoI report had clearly stated that Mr. Mahendran had provided insider information to PTL owner Arjun Aloysius and that if the proper steps were taken on time, the Rs.688 million loss could have been prevented. He said when he raised this matter about the bond scam in February 27, 2015, the Prime Minister responded in March 17 saying Mr. Mahendran was in no way involved in CB bond sales. 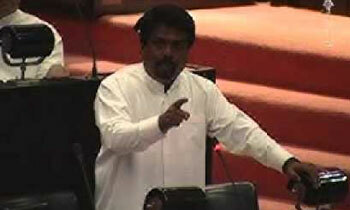 Mr. Dissanayake said they had no way of knowing the truth until the PCoI report was published in December last year. "The PCoI report had revealed that the Prime Minister could have acted with more responsibility when obtaining information. The report has indirectly held the Prime Minister responsible in this matter," he said and added that the appointment of the Pitipana Committee by the Prime Minister was another subtle move to suppress this matter. "The PCoI has clearly stated that the members of the Pitipana Committee did not have required technical or professional qualifications to investigate such a complicated matter," Mr. Dissanayake said and added that the allegations against the Prime Minister should not and could not be disregarded. He said they could not rely on the law enforcing agencies set up by Parliament and urged the people to use their power to punish the culprits. Mr. Dissanayake said the PRECIFAC report had also revealed that billions of rupees had been misappropriated and plundered by the previous government including funds belonging to the ITN, the Avant Garde transaction and the Hedging deal. PM tries to protect every crook including MR and his gang. It is a matter of "you scratch my back and I scratch your back"
Mahendran will be indicted, So, what is the grumble? Hey Did you guys forget what JVP did to this country during 1987-1989? Scooby Doo can't you guys find anything else other than 1987 to 1989. Typical frog mentality. Political speech aiming at the upcoming elections. Wonder who they will pick on once (if) PM goes! They'd all go dumb without exercise for their wagging tongues!!! JVP is the only unblemished party in this mad political circus.they should be strengthened to give the other jokers the fright of their lives. JVP has nothing in its armory to increase its vote base. Poor JVP!. They should know until someone is found guilty by the law. Political rhetoric cannot make someone guilty. Everyone is innocent until proven guilty.